wicked problems | Converge for Impact: Making Complex Collaboration Work. Complex social and environmental problems – like reducing poverty, stewarding large landscapes, or providing high quality health care and education – cannot be solved by any one action or any one organization. These “wicked problems” are constantly changing and involve many different groups of stakeholders – each with their own perspectives, goals, and proposed solutions. We believe that lasting change on these systemic issues requires building networks – people and organizations aligned around a shared purpose, connected through strong relationships, and sustained over time. Effective networks transcend silos, sectors, race, class, and other barriers to collaboration and progress. They find common ground, coordinate strategies, and collaborate generously. Organizations often find they can have greater impact and access to larger pools of funding when they work together across networks in a meaningful way. Social networks: Connect with others to develop personal relationships. Example: Facebook, LinkedIn. Learning networks: Share information over time to disseminate best practices. Example: Palliative Care Quality Network. Movement networks: Engage others to change mindsets, public opinion and policy. Example: Joy of Giving. Innovation networks: Develop and test a new model or a set of prototypes for greater impact across a system. Example: UCSF Health Continuity of Care Network. Impact networks: Identify the major leverage points in a system and act on those leverage points in a coordinated, strategic way over a sustained period of time. Example: Santa Cruz Mountains Stewardship Network, RE-AMP. In networks, form follows function – the size, boundary, process and convening design of a given network is adapted to suit its purpose. Organizations can also take a network approach to achieving their mission, without forming a formal network. For example, Interise and Catalyst Kitchens have used a network approach to service delivery to drastically increase the scale of their impact. For more details and examples of effective impact networks, see our Networks FAQ. Read The Tactics of Trust for specific examples of how participants in a large, complex collaboration can build a capacity for finding common ground. Networks involving multiple organizations are rarely successful without a dedicated individual or team of network entrepreneurs. This role has also called a network manager, coordinator, or backbone staff, but we prefer the term “entrepreneur” because networks are constantly evolving. The network entrepreneur’s role is to organize network convenings, facilitate the meetings, help form connections, and track and share information about ongoing collaborations while providing support when barriers arise. Over time, if funding is available, a single on-the-ground person working directly for the network can perform the entrepreneur role. To learn about network entrepreneurs who are ensuring that systems-level, collaborative efforts thrive, read The Most Impactful Leaders You’ve Never Heard Of. Read The Five Steps to Building an Effective Impact Network for details on what it takes to catalyze networks across all sectors and issues. This post is a part of our Think Piece series, in which we synthesize and share the most insightful concepts from our favorite books, articles & thought leaders. The following has been adapted from an interview with Jeff Conklin, Founder of CogNexus Institute, published in the Winter 2009 issue of Rotman, the Magazine of the Rotman School of Management in Toronto. Discuss the relation between ‘problem understanding’ and ‘solution formulation’. Today there is increasing awareness that a shared understanding of a given problem cannot be taken for granted, and that the absence of buy-in about a problem’s definition, scope and goals can kill a project just as surely as faulty implementation. Organizations are beginning to embrace the idea that these two aspects of projects – problem understanding and solution formulation–are not distinct phases, but rather different kinds of conversations that must be woven together from beginning to end. Problem structuring is a critical aspect of the design process that takes into account the diversity of goals, assumptions and meanings among stakeholders. At the heart of this new understanding of organizational life is the recognition that project work is fundamentally social, and that communication among stakeholders must be managed and nurtured in order for the social network to cohere into a functioning entity. Problem understanding is actually the more important and evasive part of the process. The social complexity aspect of it is that you have different stakeholders with strongly-held beliefs about what the problem is. Dealing with wicked problems is not simply a matter of coming up with the best answer; first it’s about engaging stakeholders in a robust and healthy process of making sense of the problem’s dimensions. Any way you slice it, it entails heavy lifting, and you have to roll up your sleeves and have the hard conversations in order to expose where shared understanding is missing. At Converge, we conceive of a quantum problem as a collection of wicked problems. Climate change is a mash up of all sorts of wicked problems, social environmental, even neurological. Naomi Klein’s new book, This Changes Everything: Capitalism vs. The Climate, explores these dynamics brilliantly. We’re big fans of Rotman Magazine around here, and were very impressed by a recent interview with Dr. Alpheus Bingham, the founder of InnoCentive, about the power of open innovation in addressing wicked problems, challenges the military dubbed VUCA: volatile, uncertain, complex, ambiguous. Here’s what we learned. “InnoCentive has embraced an approach called Challenge Driven Innovation. Please explain how it works. Most of the problems we work on are ‘wicked problems’. Challenge Driven Innovation (CDI) essentially recognizes that big, complex problems are really collections of lots of little problems. Once a problem is broken down, each smaller problem gets written up as a semi-autonomous, stand alone challenge. At this point, each problem is ‘portable’ a module, and as solutions to the various modules are found, you assemble them as part of the solution to your bigger problem. I visited the Stanford d.school in 2013 while Systems Director of the Irvine Foundation New Leadership Network to practice Design Thinking as a methodology for tackling the challenges faced by the city of Fresno, California. Since then, I have found Design Thinking to be a particularly effective framework for thinking about and making progress against complex, wicked problems. In 1967 the late design theorist Horst Rittel described wicked problems as a “class of social system problems which are ill-formulated, where the information is confusing, where there are many clients and decision makers with conflicting values, and where the ramifications in the whole system are thoroughly confusing.” Wicked problems are not a recent phenomenon – but new strategies have recently emerged for solving them. Empathize – As a design thinker, the problems you are trying to solve are rarely your own. Instead, they are the problems of a particular group of people. In order to design for that group of people, you must gain empathy for who they are and what is important to them. Learn to see things from their eyes. Empathy is the centerpiece of the human-centered design process. It is the work you do to understand people, including the way they do things and why, their physical and emotional needs, how they think about the world, and what is meaningful to them, all within the context of your design challenge. If you don’t initially have time to engage with real users before ideating & prototyping, try this powerful empathy exercise to bring the whole system in the room, designed by my Converge colleague and friend David Sawyer: Arrange participant chairs back-to-back in a line, so nobody is facing another person. Then dim the lights and have participants think about one person affected by the system that they want to bring into the room, in a way that honors and doesn’t trivialize them. Have participants begin with “I am a _____” and continuing briefly to describe that person’s experience in the context of the system you are trying to influence. Once all participants have finished, debrief as a group what you have illuminated about the system, and who was missing from the exercise. Define – It is your responsibility as a design thinker to define the challenge you are taking on, based on what you have learned about your user and about the context. The goal of the Define stage is to craft a meaningful and actionable problem statement. Crafting a more narrowly focused problem statement tends to yield both greater quantity and higher quality solutions when you are generating ideas. 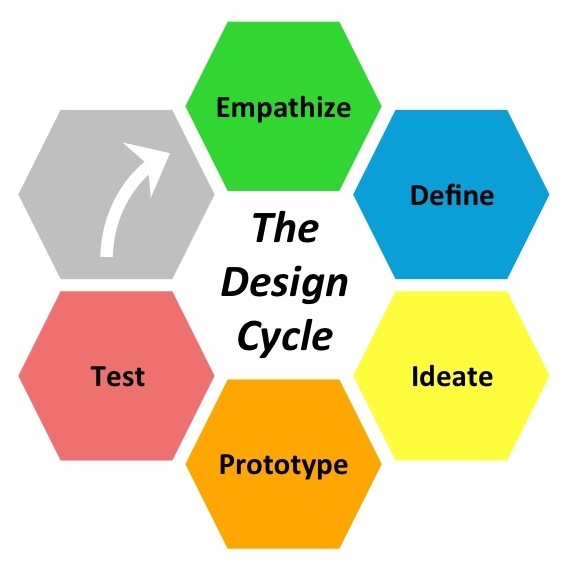 I have found that it sometimes makes sense to begin the Design Cycle process at the Define stage if you already have a loose idea of what you are trying to solve. This will help focus your Empathy activities. Then, you can return to the Define stage and refine your problem definition if necessary. Ideate is the process of “going wide” to transition from identifying problems to creating solutions for your users. It’s about pushing for the widest possible range of ideas from which you can select, not simply finding a single, best solution. The determination of the best solution will be discovered later, through user testing and feedback. To select which of your ideas to prototype, David Sawyer and I developed an “ID Analysis” (Impact x Doability) tool to prioritize your actions. Have participants or groups write each idea on a sticky note and place that idea on the matrix above. Ideas in the upper-right quadrant should be prioritized for prototyping. Prototype – Once you select your highest-potential-impact solutions, create low-resolution prototypes that are quick and cheap to make but can elicit useful feedback from users and colleagues. A prototype can be anything that a user can interact with, to help test possibilities and stimulate emotions and responses from the user that you can use to refine your solutions. Who the “user” is depends on the problem you’re trying to solve. In the education system, your users are likely students or teachers; in the health system users may be patients or health professionals. It is important to define early on in the Empathy stage who your “user” is. Test – Always prototype as if you know you’re right, but test as if you know you’re wrong. Testing is the chance to refine your solutions and make them better. Solicit feedback about the prototypes you have created within the real context of the user’s life. Continue to ask “Why?” and focus on what you can learn about the person and the problem as well as your potential solutions. Repeat – Iteration is a fundamental of good design. Iterate both by cycling through the process multiple times, and also by iterating within a step – for example by creating multiple prototypes or trying variations of a brainstorming topic with multiple groups. Once you have developed a prototype that tests positively with users, you can repeat the entire process with the goal of designing for scale. This will include a greater consideration of different user groups and contexts, a stronger emphasis on resource and capacity constraints, and a larger testing sample size. You should also consider a portfolio strategy where you test multiple potential solutions simultaneously to find the most effective combination. The Design Cycle process never ends – rather, you should continue to refine your solution relentlessly, for wicked problems will inevitably evolve beyond the scope of your original solution.